2017 has been a big year for ACT and we are proud to have achieved all of the objectives we had set out for ourselves at the beginning of the year: we ran a successful three-week entrepreneurship program which included a week-long corporate hackathon, organised 2 workshops and 3 virtual Q&A’s, participated in 4 ecosystem building activities, joined forces with Untu Capital to provide financial support to two of our alumni so that they could launch and build their businesses, and found mentors for a number of our students. It’s been a busy year. 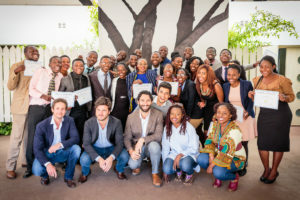 Before going into the detail of what we have achieved, we would like to thank our partners, including the Berkeley Haas International Business Development Program, Innscor, Untu Capital, The Udugu Institute, the African Leadership Academy and ARIPO, for their help in making 2017 a great year for Zimbabwean entrepreneurship. 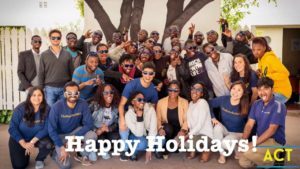 Next, we would like to express our immense gratitude to our team from Berkeley, Zaccaria Orlando from the London Business School for his invaluable contribution, and Dan Fishman and Sebastian Amenabar from the 2016 Berkeley team, who took time out of their holidays to travel to Zimbabwe and facilitate the 2017 program. Finally, a big thank you to our 2017 cohort for their hard work, and all of our alumni for remaining engaged in this great adventure that is entrepreneurship. 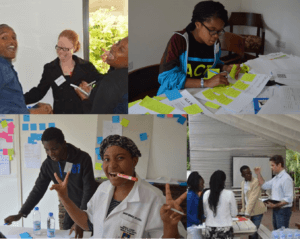 In March, we partnered with the African Leadership Academy to host the Zimbabwe “ACT Anzisha Build a Business Day” targeted at 15 to 22 years old from around Zimbabwe. We selected 24 young aspiring entrepreneurs and introduced them to design thinking and the process of developing a business model. 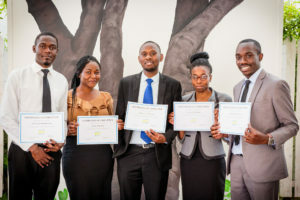 The Reysh Alef team, comprising of Nyasha, Sasha and Ropa were selected as winners. Their idea was to use waste to create art and, with the proceeds of the sale of that art, fund science kits for schools. Let’s congratulate them for reaching the semi-finals! Read more on the Art of Humanity Initiative which was shortlisted for the Anzisha Prize. This year, we received 271 applications and selected an amazing cohort of 24 aspiring entrepreneurs from around the country, which included 9 women and 15 men. The 2017 program got off to a good start with our cohort getting together for a meet and greet on the 2nd of July. This mixer allowed the students to meet each other and the IBD teaching team in a relaxed setting. The calm before the storm! The ACT Entrepreneurship Program kicked off at 8am on July 3, and from then on it was all hands on deck. During the first week, students were introduced to Design Thinking, and took part in a series of field activities and in-class exercises to get their problem solving juices flowing. The $2 exercise, where teams go out into the field and create value using only $2, stood out as being particularly successful. One of the teams managed to start a bag-making business using straw mats, and succeeded in convincing local tradesmen to partner with them in creating these bags, ALL within a space of 2 hours! Our more “mathematical” team decided to start a cigarette vending partnership with some local vendors, and they had us all scratching our heads with their financial model in the end. Another group decided NOT to use the $2, but instead focus on creating value in a service that solved a problem. How you might ask? Well, they focused on enhancing the customer shopping experience in a supermarket, by assisting customers with shopping, carrying heavy bags, etc. The shopper would then decide if this service was valuable and pay what he or she deemed fit. 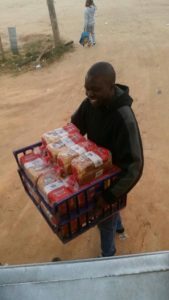 The supermarket supervisor was so impressed with this idea that he invited the team to return, train their staff, arrange some sort of partnership and offer this service on a regular basis in all the Pick N’Pay supermarkets! So to all the entrepreneurs out there that believe that capital is the only hindrance to their entrepreneurial dream, we say: take heed! At the end of week 1, ACT participants were constituted into teams and picked problem statements to work on for the rest of the program. 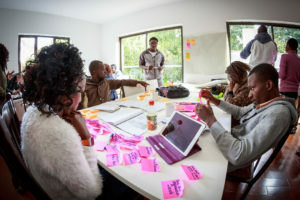 The teams started exploring ideas in waste management, cloud based health management systems, education, marketing and brand management, and value addition in agriculture. Week 2 kicked off with the corporate hackathon during which our aspiring entrepreneurs had the opportunity to apply and test all the design thinking principles they learnt in week one in a real life corporate setting. We would like to once again thank the Innscor Group for their generous support in facilitating this hackathon. 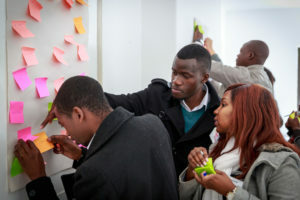 The 5 ACT teams met up with Colcom, Profeeds, Baker’s Inn and Simbisa Brands (Pizza Inn & Chicken Inn), and were assigned problem statements to work on during the course of the week. The teams then went out for fieldwork to places as far as Nzvimbo (yes, there is a place called Nzvimbo in Zimbabwe! ), waking up in freezing temperatures at 2am to get onto the delivery trucks and spend the day loading and off-loading crates of bread! On Wednesday, some of the teams faced what we could call a huge hiccup, as they learnt from the mid-week debrief that their proposed solutions had been tried before, and so had to go back to their insights and pivot in a different direction. This meant that they had less time to come up with a new solution and prepare a presentation. Yikes! Talk about pressure! However, our students remained cool-headed and undeterred, and all showed an unmatched level of commitment to meet the Friday pitch day deadline. Come Friday, all suited up, slightly nervous, roughly 60% prepared and still prototyping, our teams presented their ideas to executives from the Innscor Group. The presentations were well structured and the teams showed that they had understood the problems and that their solutions addressed the needs. What struck us as well was how well some of the teams were able to answer questions, as if they had worked in these companies for years! Need I remind you that they only had 5 days to get to know and understand their allocated company, reframe the problem, ideate and brainstorm for possible solutions, test out these ‘prototypes’ and come up with a pitch deck. Usually this takes months to accomplish! Now hold on a second, could we please just take a minute to appreciate that level of hard work! As week two came to a close, we bid farewell to our five IBD facilitators from Berkeley: Praveen, Yi, Sen, Sampada and Kate. Thank you guys for having done such an awesome job! Under the leadership of Zac, and two of our 2016 IBD facilitators, Dan and Sebastian, who loved ACT and Zimbabwe so much they decided to come back and help out during their holidays, we entered the last week of the program. 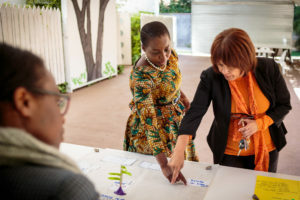 The teams had taken their ideas through a few iterative rounds of the design thinking process and had then taken a break to apply design thinking skills to a living, breathing business during the corporate hackathon with Innscor. Now it was time to get back to their own ideas. Week 3 focused on leadership, marketing, cash flows, finance, business modeling, and pitching to investors, amongst other topics. 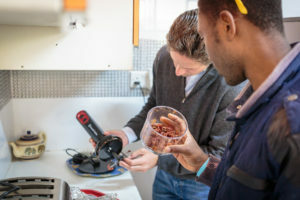 The teams were required to test their business model and determine whether people would actually pay for their offering. It was fascinating to watch our teams’ ideas take shape, crumble, and rise again in a continuous, iterative cycle and all the more interesting to witness them gain traction and improve on each iteration. 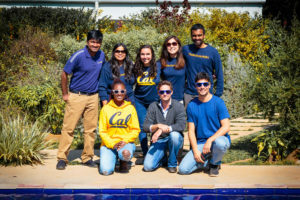 It took some time for the teams to realize the importance of ‘failing quickly and cheaply’, and pivot with their ideas and prototypes based on the feedback they received from their customer interactions. It was a very interesting week indeed! In the end, our teams leveraged all they had learned to prepare for the big pitch to our judges: Clive Msipha (Founder and CEO of UNTU Capital), Jamille Jinah (Group MD of the SIS Group) and Edward Leared (Associate at Sub Sahara Capital), whom we thank for their time and support. After some feverish pitching and tough questions, the judges were unanimous in their vote for MedFind, who put forward a viable and scalable solution to a well-defined problem. MedFind’s objective was to provide an integrated virtual wholesaler warehouse for the Zimbabwean Pharmaceutical industry. The team consisted of Sheena, Davison, Gilbert, Praise and Clint. Currently, the team is working on securing agreements with local pharmaceutical wholesalers and pharmacies and developing the web platform for their warehouse. We cannot wait to see how they get on! Team Glett came in at a close second with a sun-dried tomato powder that could be used for a variety of purposes. Well done to all the teams for the incredible level of dedication and for trusting the design thinking process. You are the ACT Cohort of 2017! Ranga is one of our 2016 alumni who was determined to setup laundry facilities in universities to help ease the life of students who have to hand wash their laundry. 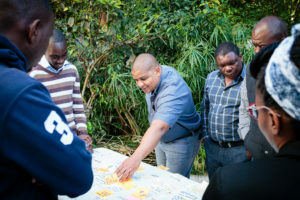 With the help of UNTU we have secured a mentor and partial funding for him to bring in laundry machines which he has set up at one of the hostels at the Harare Institute of Technology. This young man persisted and continues to persist to make his idea grow! Congratulations Ranga! 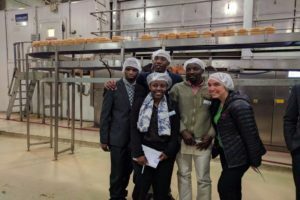 Evangelista came into the 2017 program as founder of Passion Poultry, which manufactures poultry equipment. 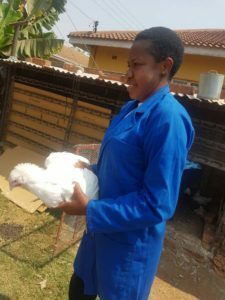 One of her most exciting innovations is a unit that eases the process of chicken slaughtering for farmers. Evangelista has shown tremendous commitment and dedication to her business and is distributing her units with the support of Profeeds. ACT provided Evangelista with a small loan to get acquire raw materials for her first big order. Well done Evangelista! This year we have hosted a couple of workshops to help our alumni along the way. ARIPO was kind enough to host a workshop around understanding and registering IP. It was extremely helpful as there is so much uncertainty about how to share and protect ideas in new ventures. 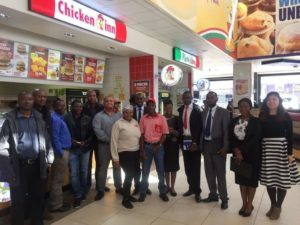 We also hosted some group discussions on Whatsapp with representatives from the Standards Association of Zimbabwe, the SME International Expo and Donsa-Nkomo and Mutangi Legal Practitioners. 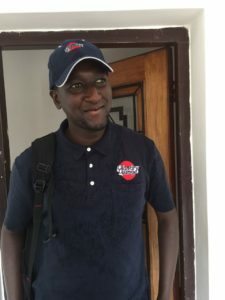 In mid December we will be hosting a financial literacy class in partnership with Terrence Mugova, Founder of Educate, a three year old startup based in Bulawayo. He significantly contributed to the Financial Literacy Handbook for Entrepreneurs that we are currently working on. Watch for details on how we will help you demystify the world of finance. 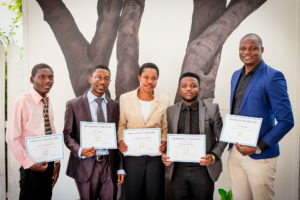 We finished the year in Mozambique at the Seedstars Africa Summit, where our Program Coordinator mentored three of the 16 startups from across the continent. After that, our offices will close for the Christmas break, and reopen on January 2 for another exciting year. We hope you enjoyed the snap shot of what we achieved this year! Once again, a very big thank you to our partners, program participants, teaching team and our advisory board! In particular, we would like to give a supersized thank you to Zaccaria Orlando, our intern from the London Business School. We would have not been able to accomplish as much as we did without his help and continued support! And a special thank you to Chenai Muchena, our 2016 Alumna, who came in as a consultant, and helped hold down the fort with her infectious energy, great ideas and hard work. Next year we hope to have an action packed year lined up to help equip you for your entrepreneurial adventure. 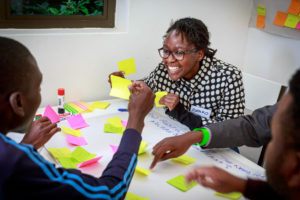 We are super excited to be hosting next year’s program in Bulawayo at the Tech Village! Applications for the 2018 program will open in April. That is all for now, stay tuned for more updates, stay safe and have a Merry Christmas and a Happy New Year!